^ 1.0 1.1 1.2 1.3 1.4 Info to GO (PDF). GO Transit. 2014-01 [2014-05-31]. （原始内容 (PDF)存档于2014-07-14）. ^ Metrolinx Overview. Metrolinx. [1 July 2011]. ^ Quick Facts: GO Buses (PDF). GO Transit. [24 May 2011]. （原始内容 (PDF)存档于2012年1月3日）. ^ 7.0 7.1 Pearce, Sean. Stacking the deck for transit service. Markham Economist and Sun. 9 April 2008 [2008-04-11]. ^ Sergeant, Ch.3: MTARTS, the commuter study. ^ Sergeant, Ch.4: Buying the trains. ^ GO Transit: Toronto in Transit. Progressive Railroading. May 2011 [1 July 2011]. （原始内容存档于2012年3月12日）. 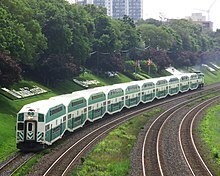 ^ GO Transit reaches one-billion passenger mark. Progressive Railroading. 18 October 2006 [1 July 2011]. ^ GO Transit. GO 2020 (PDF). [7 June 2011]. （原始内容 (PDF)存档于2012年1月3日）. Garcia, Daniel; Bow, James; Marshall, Sean; and Drost, Peter. Regional Transit Routes - Transit Toronto. 10 November 2006 [15 June 2011]. Sergeant, Wilfred. Building GO-Transit: The Rail Commuter Initiative of The Government of Ontario & Canadian National Railways, People in the project 1965-1969. Starkville, MS: HTA PRESS. 2004 [2006-05-02]. （原始内容存档于2006-05-13）.